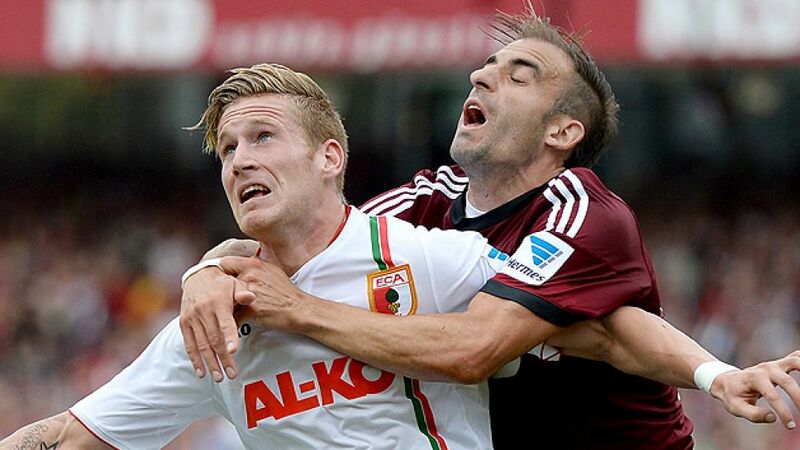 Augsburg - FC Augsburg are looking to make it nine Bundesliga games unbeaten when they host 1. FC Nürnberg on Matchday 21's penultimate game this Sunday (kick-off 15.30 CET). Markus Weinzierl's men are on their best run of form - five wins and three draws - since the club was promoted to the Bundesliga in 2011, but they will be up against a Nürnberg side also high on confidence after a promising start to the Rückrunde. Weinzierl has worked wonders with Augsburg since taking over as coach in the summer of 2012. Die Függerstädter beat the drop last season and are currently on course for a comfortable top-half finish this term: FCA are ninth in the league table with nine victories from their 20 games so far, although Weinzierl himself reiterates that the club needs to remain realistic and fulfil their target of staying in the Bundesliga for a fourth season. "Nobody expects us to qualify for Europe," he told magazine 11 Freunde recently. "To most people we're still candidates for relegation." Indeed, Augsburg versus Nürnberg pits two clubs against one another that have both fought the drop in recent years, and Weinzierl is under no illusions about how tough a task awaits his team. "A derby at home to Nürnberg is a huge challenge and a game we want to win, but it will need a huge amount of hard work." The former FC Bayern München player alluded to the bragging rights on offer ahead of the game, especially in view of an opportunity to record a league double over der Club, and end a hugely undesirable run against their near neighbours. "Augsburg haven't beaten Nürnberg at home for 40 years - that's something we want to change. We lost to them at home last season and it hurt, so the players are excited for this one." Nürnberg, meanwhile, will be just as motivated for the trip south. They began 2014 with victories against 1899 Hoffenheim and at Hertha Berlin - their first wins all season - and gave runaway leaders Bayern a fright on Matchday 20, before succumbing to a courageous 2-0 defeat. This will be a different test for Gertjan Verbeek’s men, however, as the coach admitted in his pre-match press conference. "Augsburg have an idea of how to play and how to defend, and they execute it together. Every one of them knows what his team-mate is doing." The 52-year-old continued, "I think it will be an open game and the first goal will be very important." With both sides' defensive records improving in recent weeks, the opening goal could well be decisive, and Verbeek will be hoping that Josip Drmic comes up trumps away from home again - seven of his ten goals this term have come on the road. Japan international Hiroshi Kiyotake also scored in this fixture last season - a 2-1 win for Nürnberg - and is due a goal after a 13 games without finding the net. Augsburg have their own free-scoring midfielder in Andre Hahn, however, with the former Kickers Offenbach man netting his eighth and ninth league goals of 2013/14 in the 4-1 win at VfB Stuttgart last weekend. One of these teams may be in more need of the points than the other, but there will certainly be no quarter given at the SGL-Arena on Sunday.